Brilliant amber color. Spicy, grainy aromas and flavors of nut bran cereal, dried dill, carob bar, and leather bound cigar box with a supple, lively, dry-yet-fruity medium-to-full body and a warming, layered, long finish with notes of herbal honey on pound cake, menthol mint, sandalwood, and turmeric chai finish. An exotically spicy and herbal rye. Bottom Line: An exotically spicy and herbal rye. 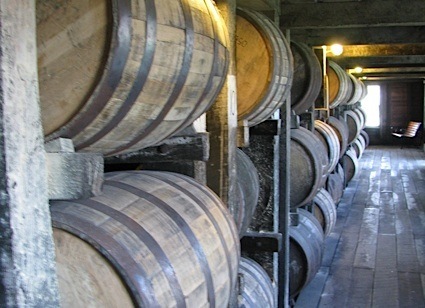 83 • Cadée Bourbon Whiskey 42% (USA) $39.00. 89 • Cadée Rye Whiskey 42% (USA) $39.00. 90 • Cadée Gin 44% (USA) $34.00. 88 • Cadée Intrigue Gin 44% (USA) $34.00. 84 • Cadée No4 Vodka 40% (USA) $30.00. 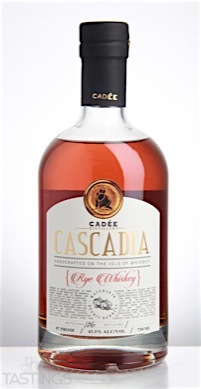 93 • Cascadia Rye Whiskey Finished in Port Barrels 43.5% (USA) $49.00. 88 • Deceptivus Bourbon Whiskey Finished in Port Barrels 42.5% (USA) $49.00. Cascadia Rye Whiskey Finished in Port Barrels rating was calculated by tastings.com to be 93 points out of 100 on 9/10/2016. Please note that MSRP may have changed since the date of our review.